Is your path your own? Too often we walk a path that is not our own. Either our parents set it out for us or a religious individual. (i have unfortunately been on paths caused by both in my past.) These people may or may not have our interests at heart - but that doesn't matter. You should be the only one who creates and runs your path. And, by the way, that most definitely includes fear. If you are doing something because you are afraid if you don't do it something bad will happen? You are not on the right path. If the path you are on is based on fear, get off. If the path you are on is controlled by others, get off. 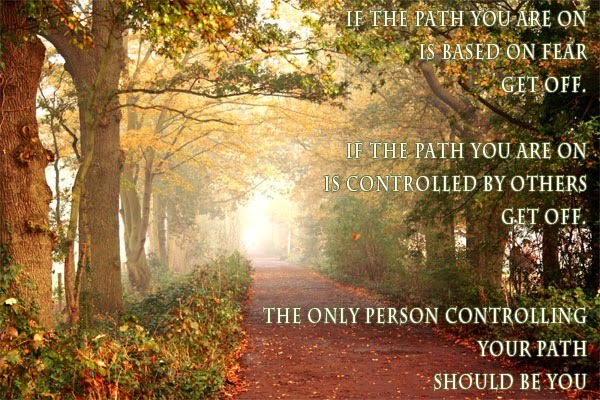 The only person controlling your path should be you.